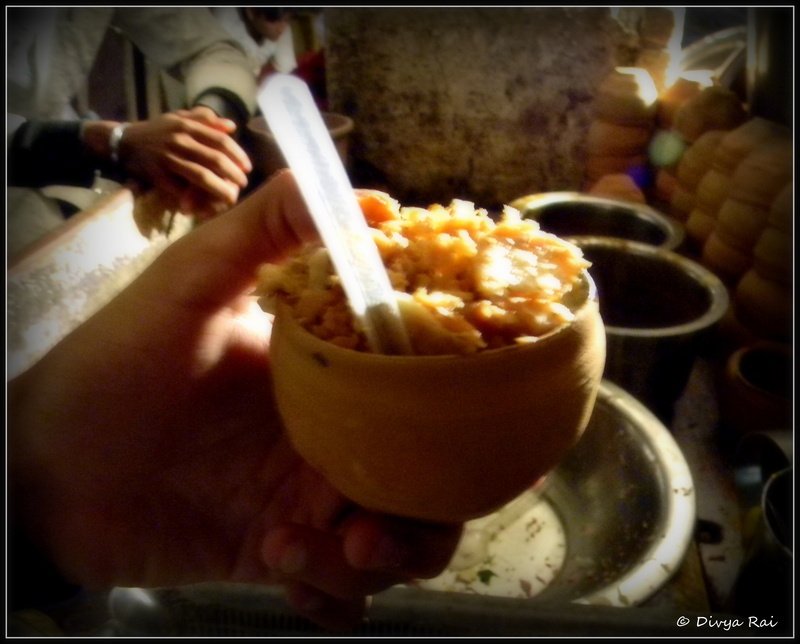 This particular blogpost isn’t meant for the kind of people who go “Eww..!” , whenever any kind of street-food is mentioned to them. So please be warned, if hygiene is what you are looking for, this post ain’t that nook. Stop right here, for your own good. This post discusses (in pictures) the elements of a small town ‘thela’ (hand-cart). 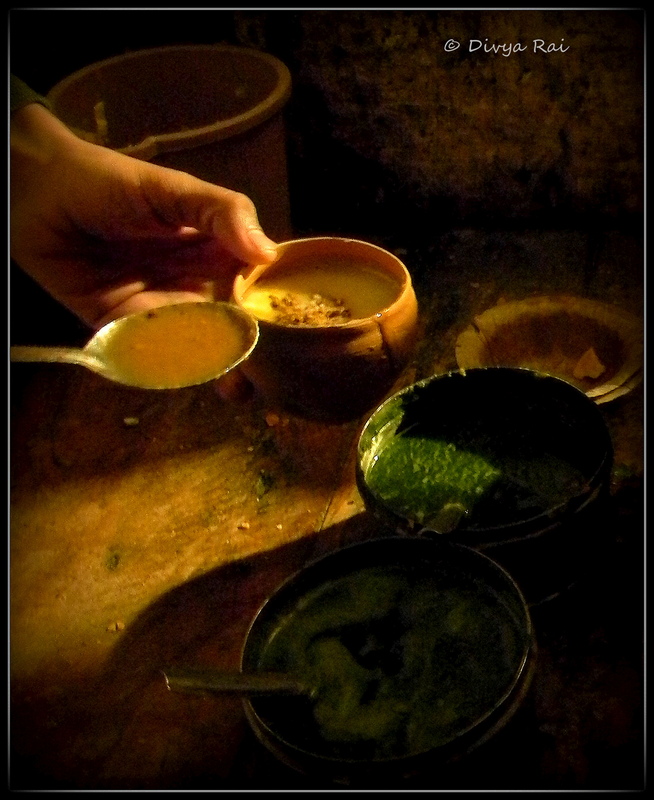 And explores the steps involved in making ‘Moradabadi Daal’ – a famous street food of Western Uttar Pradesh. 1) The components of a ‘thela’ comprise of “elements of convenience and economy”. While the utensils used in making the “daal” are made of stainless steel, you could be served the chaat in plate/bowl made of leaves/pottery-mud/stainless-steel/plastic. The ‘daal’ is slow-cooked in a utensil made of steel. 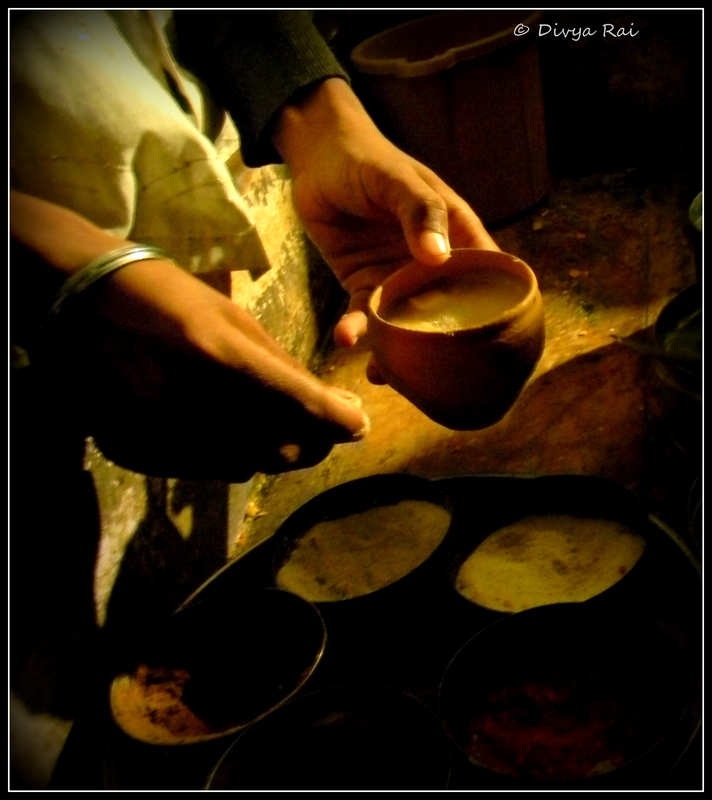 2) The bowls made of leaves, called ‘pattal‘, are stacked neatly on one side of the handcart. These pattals are made of either the ‘banyan’ leaves or the ‘sal’ leaves. It is an eco-friendly medium for commercial usage. Even though it is not re-usable, the good part is that it is bio-degradable and helps the small pockets of the rural population earn their bread and butter. 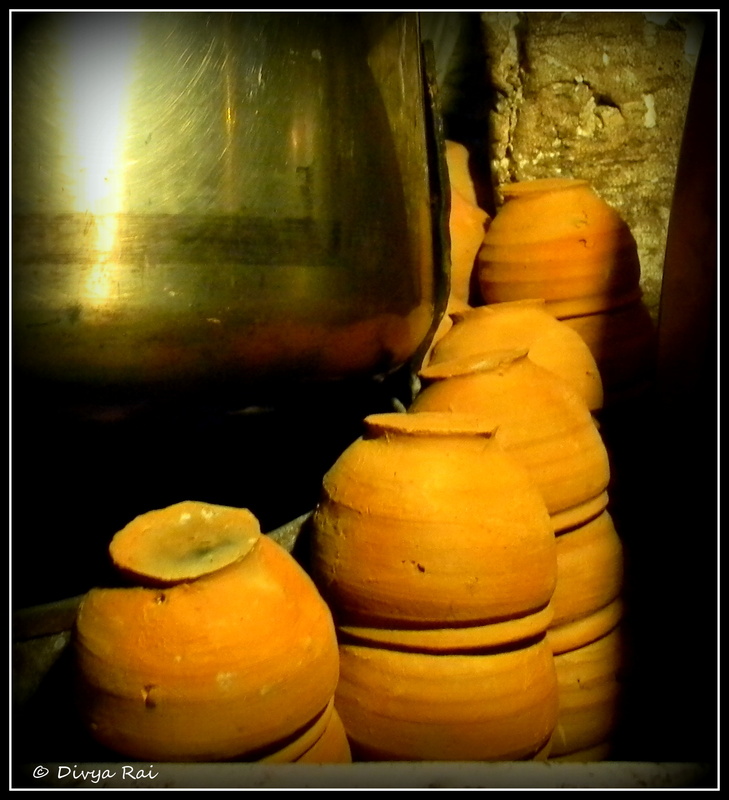 Same are the factors for ‘kulhad’- the earthen bowl/cup, used for serving ‘chai’ in major parts of the country. ‘Kulhad’, stacked upside down, one on top of the other. 3) Now begins the process of making the famed ‘Moradabadi Daal‘. 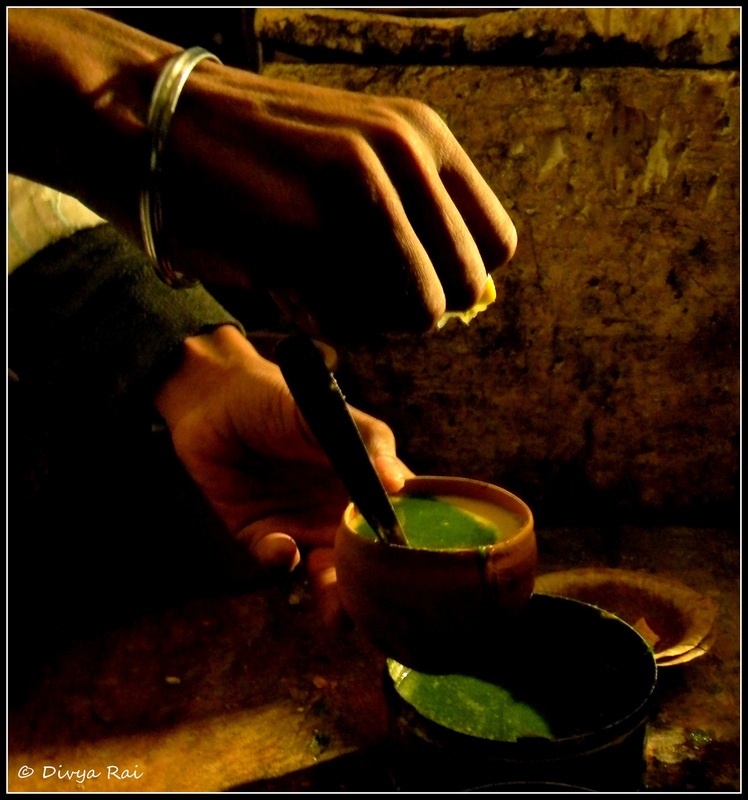 For the purpose, ‘moong daal’ (Golden gram) is used as the main ingredient. Moong daal used to be my least favorites of daals (lentils) until I had this. Basically, in my head, it was something meant for people with upset tummy and needed something easy to digest. 4) The spices and salt are added as per the customer’s preference. 5) After the spices and the salt, various chutneys (sauces) are added to the mixture. There are multiple combination of chutneys, depending on the kind of taste you want for yourself. The green chutney has coriander and garlic, while the red one has spicy pepper. The brown one is a matter of taste, as it contains tamarind and sugar, and that is what lends it the status of a ‘chaat’ (a kind of street-food in India) . 6) After this, goes in some lemon juice. 7) And finally, some ‘matthri’ and chopped onion and tomatoes.